How do I attach the plaque to the wall? 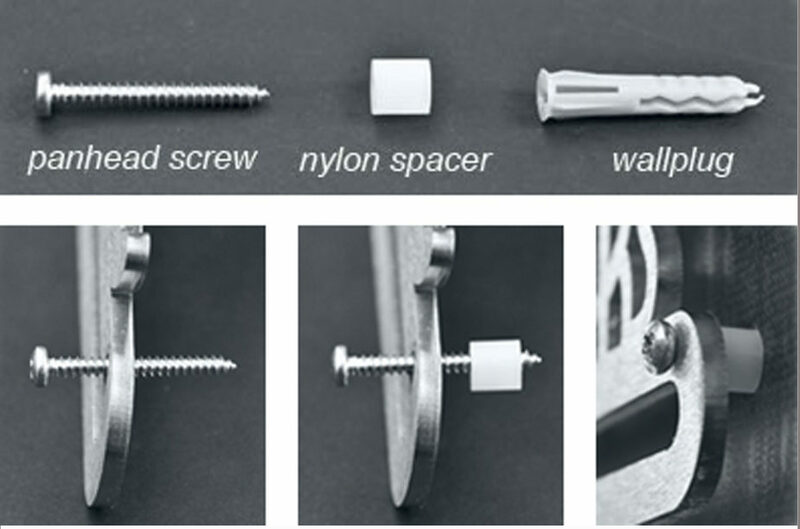 All plaques come with installation instructions (as shown below), nylon wall spacers, wall plugs, and mounting screws. All display plaques have two mounting holes. When attaching to the wall it is important to use a spirit level to ensure the horizontal. With the display in position mark the site of each hole with a pencil. Using a 5mm drill bit, drill holes at the two pencil marks. Push in the wallplugs until flush with the surface of the wall. Attach the display to the wall using the panhead screws, sliding the nylon spacers onto the end of the screws from the back of the display. Screw the display onto the wall and then hang your medals. How many medals will my plaque display? You can spread them out or bunch them up. Our 13 inch plaques should neatly display approximately 12 medals depending on the width of the ribbon. However, you can hang more if you allow the ribbons to overlap. For international orders outside of the UK please contact us and we will advise the cost of shipping. Here at The Runners Wall we guarantee 100% satisfaction on all of our products. If you are not completely satisfied with your purchase, you may return it to us in its original condition for a complete refund within 30 days of receipt. To return a display simply send us an email outlining your reasons for the return. We recommend that all returns be sent via a traceable carrier. Keep the Return Tracking Number associated with the package you are returning to ensure that the package is returned and tracked successfully. Stainless steel is easy to clean. Wiping with a clean cloth that has soap, mild detergent or even baby oil will remove dust and ingrained dirt. If your plaque were to get scratched try buffing with a superfine Liberon or Scotch-Brite pad. It is very important that you rub in the direction of the grain. Once payment has been received, your order will be confirmed and delivery date advised. Online payment is through PayPal. To contact us simply click on our Contacts button and we will respond to you as quickly as possible.